Rolling Hills Covenant Church: Easter Sunday - Volunteers Needed! Easter Sunday - Volunteers Needed! Thank you for signing up to volunteer on Easter Sunday! Please see the different ways you can serve below and sign up for the time slot(s) and location(s) you can help at. Note: All volunteers must check in that day in the Welcome Center before proceeding to your station (with exception of tent ushers - instructions below). Warmly welcome, greet, and shake hands with people as they arrive and wait for the shuttle at the North Campus parking lot shuttle stop. Margaret will be with me as well. Warmly welcome, greet, and shake hands with people as they arrive and wait for the shuttle at the Jack In The Box parking lot shuttle stop. 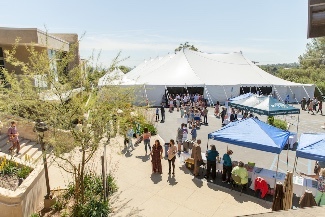 Warmly welcome people and help direct them towards either the Worship Center (8:00 and 9:30 only) or towards the Tent (9:30 & 11:15 only) OR to the Spanish worship service in the 290s (9:30 only). Support teachers in the classroom, engage with kids and guide them through the resurrection story through activities, worship and prayer. Greet people warmly and serve coffee, donuts, and water. Bibles are free for anyone who wants one. Gift bags are for newcomers only. Refill items neatly on the table as needed. Clean up 3 hospitality stations: Return to 181- pop up tents (you must fold them up), Bibles, water bottle cases, and gift bags. Return to Carslon Hall kitchen - coffee containers, all food/drink supplies, and tablecloths. Welcome guests at the tent entrance with a worship folder and smile, help take offering and head count. Please check in with Jerry at the usher table in the green hills corner of the parking lot.